Just after Christmas last year, I finally finished the book that I had been stuck on for 5 months – The Name of The Rose by Umberto Eco. Haha I’m not sure if it was completely worth it, because while it was lovely and fascinating in parts, it was pretty hard work to get though it. But hey, I have been trying to read that book since 2000 and I’ve done it damn it! I will never wistfully wonder what the book is about, or how the words flow from its pages, or what it is like to experience Umberto Eco’s literary vibe. So after that, on the other side of the literary spectrum, I decided to read something “light and easy” and I found Divergent (Book 1) and Insurgent (Book 2) in an op shop for $2 each. 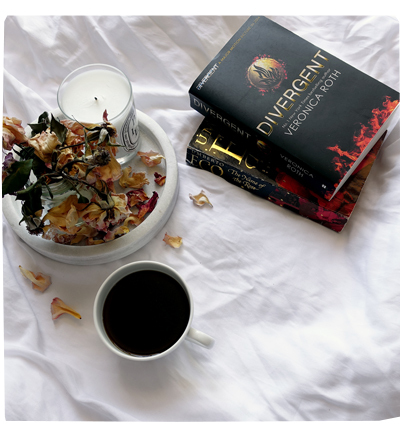 They are young adult, science-fiction dystopia novels, with a thread of romance. I’ve watched the movies. The guy was hot. I breezed through the first book in a few days. My verdict: The movie seemed to craft the story and characters much better. It was a fun read though. I took a longer time to get through the second book because, um the teenaged drama made me cringe. So here is my completed reading list for 2016, starting with the book I read in January 2016. 1. The Wind-Up Bird Chronicle by Haruki Murakami. You can check out my whole list over at Goodreads, although you have to be logged in to see the list in chronological order, I think. My favourite book of the year goes to Anna Karenina, as I often find myself thinking about the characters at random moments in my day to day life. Followed closely by Great Expectations and All The Light We Cannot See. The Martian as pretty cool too; I always look at a potato and smirk. The novel I regretted reading was The Husband’s Secret. While it was a fast-paced, engaging page-turner, set in the modern day… I got to the end and I felt like I had watched a run-of-the-mill TV drama. I instantly regretted dedicating such a huge portion of my daily brain energy to it and giving up my sleep for it! Ugh. It was highly entertaining while I was reading it and very well written, but in terms of conjuring up lingering thoughts about human nature or society, it didn’t affect or alter me in any way.